Home > Advertising & Promotion > Questionnaire: What is the Target Market for Your B & B? Every business should have a marketing strategy and your B&B is no different, no matter how small it is. Part of this strategy is knowing the target market for your B&B. Advertising on the internet and in newspapers is all very well, but it won’t be successful unless you know who you are advertising to. No B&B will appeal to all potential guests. Here's a quick run down of the questions you need to ask yourself to work out what is (or should be!) your target market..
1. Where is your B&B? Maybe you are on the beach front or nestled near a national park. 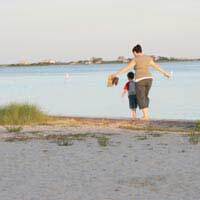 The beach will attract young families while the national park will appeal to active visitors who love to walk. Once you have established who is more likely to visit your area, you can zoom in on those markets. 2. What kind of visitors come to your area? You need to find out the average age, occupation, income and family size of the people your town or village attracts. Where does your B&B fit in? If the visitors are mainly young, you might need to update your rooms and provide a modern, flexible service. Older guests might appreciate more traditional surroundings. Adapt to the target market and advertise your business according to the demographic. 3. Can you appeal to a niche market? Do you accept pets in your B&B or do you have large family rooms? Find out what your competitors offer and if you are the only establishment in your town to specialise in a particular area, capitalise on it. Reach out to those pet lovers, couples with children, or any other niche market you can find. 4. Why do visitors come to your area? It's important to know why people come to stay in your town. Are they mostly tourists or is there a high proportion of business people? Do they primarily visit family? Ask them and record the information so that you can spot trends. Then you can adapt your B&B and your advertising to suit and market your strong points. 5. Are your guests local or national? You need to know this to know whether to advertise locally or nationally. Your area might have appeal from Land's End to John O' Groats, in which case you can advertise in national newspapers and magazines. But if the majority of your guests come from within a certain radius then concentrate your efforts in that area. 6. Do your guests book in advance or drop in? You might have your B&B in an area where people stop off on the way to somewhere else. If this is the case, make sure you are well signposted from the motorway so people can find you easily. 7. Do you have a special interest? Perhaps you have a hobby or passion you can share with your guests. Are you a whiskey connoisseur with a fine collection or a cycling enthusiast? Identify markets that share your passion and you could attract a whole new ranger of guests. 8. Is there a monument or museum of historical interest near you? Some towns are known for their rich history. Find out if this attracts visitors and include it in your marketing. 9. What does the competition offer? It's worthwhile checking out the more established, successful B&Bs nearby. Look at what they offer, their rooms, their style. What they have obviously attracts guests so it can work for you too. 10. Is there a local B&B association? Most associations publish a B&B guide and you need to be included in it. Many guests' first port of call will be a book or an accompanying website guide to find their accommodation. Here you can outline your differences compared to your rivals. This may seem like a lot of work but will be worth it when you know exactly which visitors you're appealing to and how to target those markets.